In my last post, I proposed a simple way to graph tonal gravity against the octave. Overtonal notes, generated by multiplying, are restful, stable — they have positive polarity, pulling toward the center. Reciprocal notes, generated by division, are restless, unstable — they push. I call this negative polarity. Mixed-polarity notes have both, and I’ve chosen to simply add their overtonal and reciprocal components together to get the total polarity. Here again is the graph of the 13 most central notes of the lattice. The stable notes are gravity wells, and the unstable ones are peaks. Melodies and harmonies dance in this gravity field. Higher points represent tension, lower ones resolution, and the lower they are, the more resolved and stable. The tonic major triad, most stable of all, occupies the lowest spots — 1, 3 and 5. The notes are all overtonal except the 4, which is strongly reciprocal, and the 6, which is mixed and slightly unstable. Here’s a split screen video showing the major scale, against a tonic drone, on both the lattice and the octave. This is an example of how the lattice serves as a Rosetta Stone, a translator between harmonic and melodic space. Can you hear the push/pull quality of the notes? Each note has its own feeling against the steady 1. I believe the sensation of tonal gravity is the most important driver of tension and resolution in tonal music, music that has a central key note. The tonic is like a sun, creating a gravitational field around it. The lattice is a beautiful map of this gravitational field, in harmonic space. Tonal gravity acts like real gravity, in that it’s strongest close to the center. The farther out you get, the weaker the effect. Overtonal notes are stable, reciprocals are unstable. Reciprocal intervals create tension, overtonal ones create resolution. The article on Polarity goes into detail, with examples. The lattice can be divided into four quadrants, each with a characteristic tonal gravity. The northeast quadrant is entirely overtonal. This is the world of Major/Dominant: overtonal thirds, overtonal fifths. The southwest quadrant is entirely reciprocal. 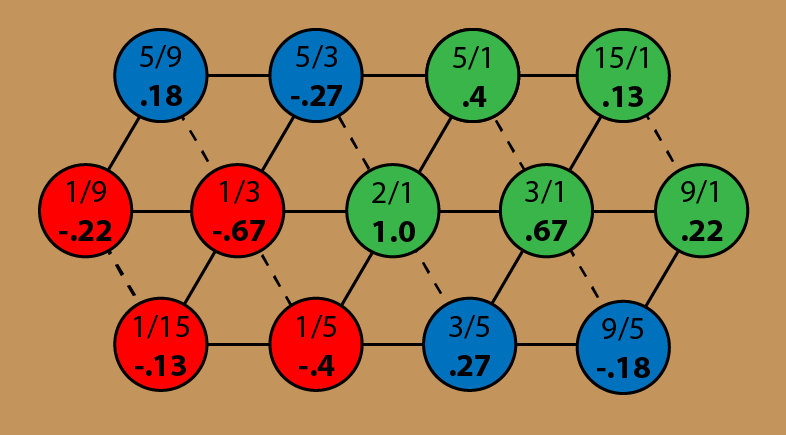 Every interval is generated by division. Green is overtonal, stable, tonal gravity pulls. Red is reciprocal, unstable, tonal gravity pushes. Blue is mixed, gravity pulls on one axis and pushes on the other. Multiplying or dividing by 2 does not affect tonal gravity. This is to account for the octave phenomenon — going up or down an octave does not change a note’s position on the lattice. I will call the direction and magnitude of the tonal gravity field P, for Polarity. Intervals are expressed as a ratio of two numbers, numerator and denominator, N/D. For example, a perfect fifth is 3/1, or N=3, D=1. For purely overtonal notes, of the form N/1: P = 2/N. For purely reciprocal notes, of the form 1/D: P = -2/D. For compound notes, with both overtonal and reciprocal components, add the overtonal and reciprocal gravities together: P = 2/N – 2/D. The ratio of the tonic, the 1, is 2/1. I’d better explain that last one, because it would seem at first glance that the ratio of the tonic would be 1/1. But what is the actual tonic? It has no specific pitch. It is not a ratio. It is an abstraction, the anvil upon which all notes are forged, the sound of one hand clapping. If a song is in the key of A, all of the A’s from subsonic to ultrasonic are actually octaves of the tonic, created by multiplying by two. It is impossible to say that any one of these A’s is “the” tonic — the tonic is “A-ness,” that thing which connects the numbers 110, 220, 440, 880, to infinity in both directions. 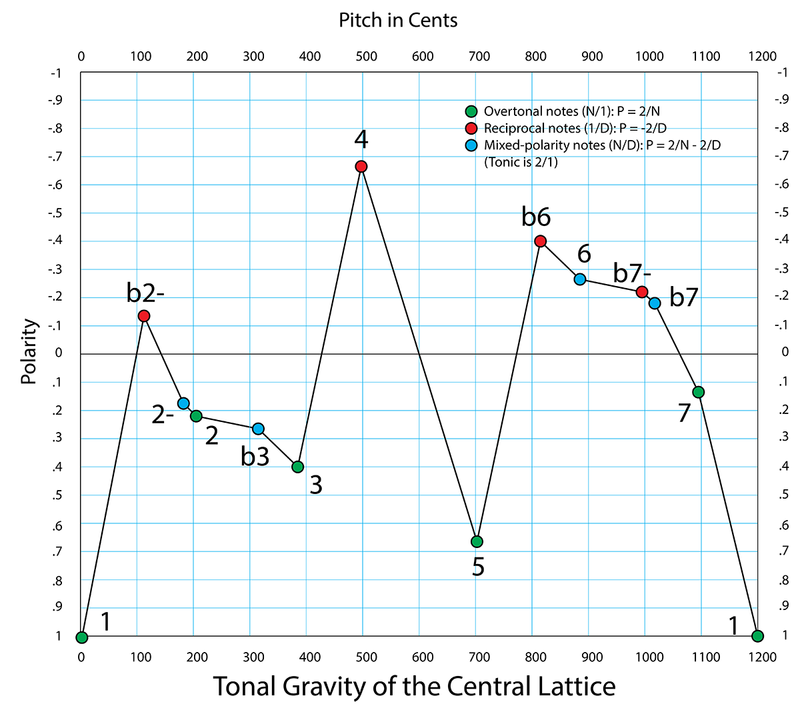 I submit that the “1” of the lattice, which is a real pitch (or set of pitches, an octave apart, just like all the other notes) is in fact the octave, and its ratio is 2/1. Here’s another drawing of the inner lattice. Instead of the note names, I’ve filled in the ratios, and the value of P.
The green notes all have positive polarity, getting weaker as they get farther out. The red ones have negative polarity, also fading with distance. The blue ones have different polarities. Sometimes the overtonal part dominates, sometimes the reciprocal. The b3, just southeast of the tonic, is a mixed-polarity note. Its ratio is 3/5, combining an overtonal fifth, P = .67, with a reciprocal third, P = -.40. If I just add the two gravities together, I get a positive net polarity of .27. This makes sense. The minor third is considered to be a stable interval, though not as stable as the major third. Both the major and minor triads consist entirely of stable intervals with positive P, which helps explain their special place in music. So: now that I have some values for P, I can graph the tonal gravity of these 13 inner notes against the octave, in order of pitch. Positive polarity is at the bottom, so that the feel is the same as real gravity. Unstable notes are up on mountain peaks, and when they resolve to stable ones they slide down into the gravity wells of the stable notes. There is that tasty melody zone I mentioned a few posts back. The whole region from 2- to 3 is stable. The 4 is an isolated peak, and it’s easy to imagine a 4 sliding into the pocket of the 3, or the 5. This is what happens when a Sus4 chord resolves. The 7 is lightly stable but hanging on by its fingernails — it’s called the leading tone, because it “wants” so badly to resolve to the 1. 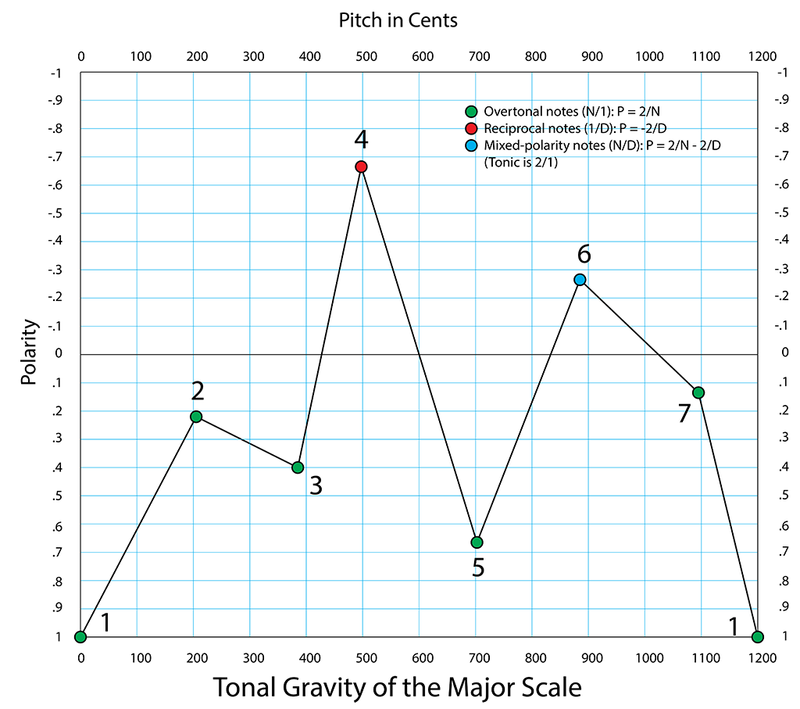 The tonal gravity of the 7 is usually thought of in terms of melodic pull — here’s a graphic demonstration that it has harmonic pull as well. There is an unstable region from b6 through b7, with all the mirror twins of that stable melody zone. A melody will sound unstable, unresolved as long as it stays in that region. This is the gravitational field in which the music moves, a sort of tonal skate park. Major and minor chords look like triangles on the lattice. They are closed loops, which I think contributes to their stable feeling. Up a major third, up a minor third, and down a fifth (due West on the lattice) brings you right back where you started. The intervals interlock, and they are all consonant, reinforcing the sense of harmonic rest. Other combinations of notes are more open. Many chords look like straight lines on the lattice. To my ear, this stack of thirds has a distinctive sound, almost like cloth ripping. A Suspended Second chord is a straight line, like an augmented chord, but on the horizontal axis. It’s a stack of two fifths. 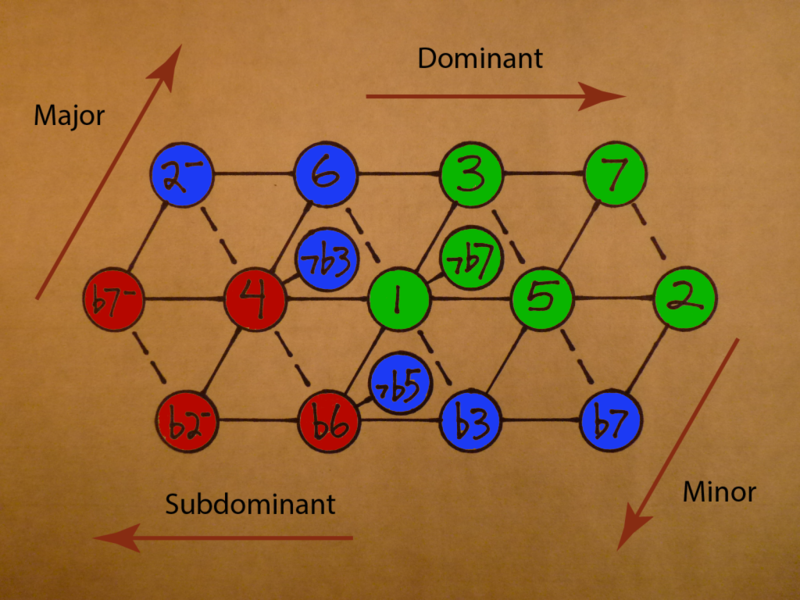 At the time the Sus2 and Sus4 chords were named, the 2 and 4 were usually “suspended,” or held over from the previous chord, as a tension to be resolved. Now they are often used as full chords. The Police used these stacks of fifths a lot. Andy Summers’ guitar part for Every Breath You Take is full of Sus2 chords, alternating with major and minor thirds. To me, Sus2 feels lightly stable, and wistful. All the intervals are overtonal, and quite consonant, but unlike the major and minor triads, the Sus2 doesn’t come full circle. If it keeps going, it will never return home, but climb on up the endless spiral of fifths. It’s a great way to end a certain sort of song, finished but with a sense of longing. The Suspended Fourth consists of a root, a perfect fifth, and a perfect fourth. The Sus4 looks the same on the lattice as the Sus2. The difference is the root. This chord has a wonderful tension. The root establishes home. The 5 is overtonal, stable, with strong tonal gravity that attracts. The 4 is reciprocal, unstable, with a strong tonal gravity that repels. Resolving to the 3 is satisfying indeed, as the unstable 4 slides from its unstable peak into the stable gravity well of the major third.